We know that the temperature requirements of piglets and sows in the farrowing house are quite different but what about the different light requirements of sows and those who work with them? 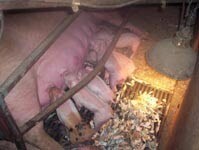 Defra states that pigs in buildings with no natural light should have at least 40 lux of supplementary light for a minimum of 8 hours per day.However, 40 lux does not provide adequate lighting for staff to observe pigs in detail and therefore it is harder to achieve a high standard of farrowing house management. Click here for more information on the level of lighting needed for staff to work effectively as well as addressing the sow's needs. See if it can make a difference to unit productivity.